When, as earlier recorded, Sir Thomas Sopwith mentioned a stalling speed of about 50 mph (80 km/h) for the Churchill, one noted that this figure seemed to be 'a shade high', the reason being that one carried in one's mind the speed range that the makers later quoted for the roughly comparable Dove, a little civil aeroplane of many distinctions. The quoted figures were, in fact, 35-100 mph (56-160 km/h) - with a Le Rhone engine of 80 hp only and when seating two occupants. One might be forgiven, in this regard, for sensing a margin of give or take at either end of the scale; yet even if some such allowance is made (and likewise for the first flush of post-Armistice salesmanship) the figures represent an impressive achievement - especially so as the Dove was not, in the fullest sense, a new type, being little more than an adaptation of the 1916 Pup. 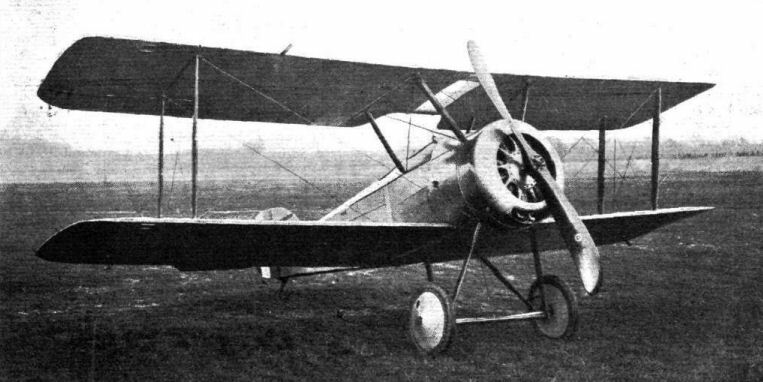 'Sporting two-seater' was the description by which this tiny tourer/trainer of 1919 was publicized - the 'trainer' element, attributed by the present writer, being implicit in the claim that, when fitted with dual control, the Dove was 'particularly suitable for instructing pilots, who have passed their preliminary tests, before placing them on high-powered single-seaters'. Powerful single-seaters being in 1919, as now, mainly of a military persuasion, the 'sporting' aspect must be viewed accordingly, and the very low stalling speed quoted must not be construed as a 'pussyfoot' approach to the postwar market. This Dove of peace had an ancestry of war-hawks, and its 'stunting' capability was one of its hoped - for selling points, in which connection a factor of safety of 6 was claimed. Unfortunately for the rotary-engined Dove and Gnu, aviation was not - even in the lean postwar years - trying to go 'back a few paces'. The 'ancestry of war-hawks' earlier ascribed to the Dove is most firmly established by naming men before aeroplanes, and in particular Maj W. G. Barker vc, exponent of the Snipe; for it was Barker who, on 10 May, 1919 (with Harry Hawker away in Newfoundland) ensured a truly royal debut for Sopwith's latest product. Barker, though still convalescent from his mighty battle of October 1918, not only flew the Dove to Hounslow in the following May, but carried as a passenger on an aerobatic session the still-youthful Prince of Wales (later Duke of Windsor) - much to the displeasure of the Prince's father ‘KG5'. Thus, whatever peace the Dove came bearing on its little back-swept wings, that peace was not borne on to Buckingham Palace. The wings of the Dove were, in fact, the salient visual difference between it and the Pup, and some of the old hands were quick to make comparisons, one of these observing: 'The Dove is a two-seater version of the famous Pup, one of the most delightful of Service machines as far as ease of flying is concerned. Generally speaking, all dimensions are practically the same. In the Dove the span is cut down by 1 1/2 ft. and the overall length is increased by a few inches.' More explicitly, this gentleman might have remarked, the Dove was a little longer than the Pup because it had two seats (in tandem) instead of one, and its span was less because the wings were swept back to get the centre of lift further aft accordingly. 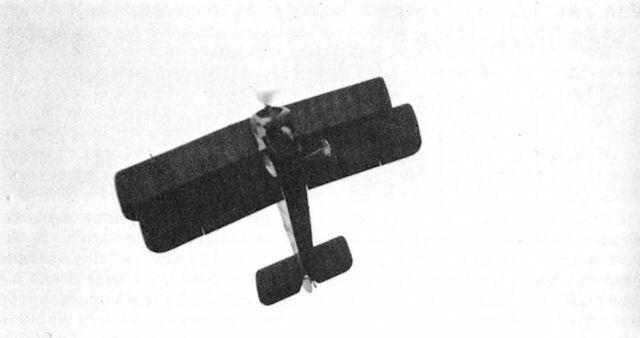 That a single-seat version - still with swept-back wings, in one form at least - nevertheless existed is proved by a photograph; and that this version differed otherwise from standard is apparent from what appears to be a wind-driven pump or generator (as on the contemporary Gnu) visible between the V-struts of the landing gear, and possibly attached to the port bottom longeron. Other seeming peculiarities - in the engine installation, for example may be more apparent than real, though one clear possibility is the fitting of extra petrol tankage instead of the second seat. No markings, apart from the makers' name and address on the fin, appear, and there is no reason to suppose that this machine was G-EBKY, later in life to be converted to a semblance of a Pup and famous to this day as the 'Shuttleworth Pup'. G-EBKY was, in fact, the last of ten Doves to appear on the British Civil Register, and the intimate details of its history are related at length by Harald Penrose in British Aviation: The Adventuring Years. To the foregoing, the present writer would only add that Bert Hinkler (full Christian names Herbert John Louis) had worked for Sopwith before he joined the RNAS - as a mechanic, the capacity in which he had served back at the old Kingston Skating Rink. The Dove used by Barker to fly the Prince of Wales at Hounslow was G-EACM (ex K-122), though for the Royal jaunt its fuselage carried only the name "Dove', in small capital letters, following a then-established Sopwith practice of distinguishing the flow of new types introduced during 1918/19. This same machine appears to have gone to Bishop-Barker Aeroplanes Ltd. of Toronto, in 1920, as G-CAAY. Then came G-EACU (ex K-133), registered to Maj Olof Enderlein of the Royal Swedish Air Force in 1923 as S-AFAA; G-EAFI (ex K-148) sold in Norway during 1921; G-EAGA (ex K-157) sold somewhere overseas in September 1919 - as was G-EAHP (ex K-168); G-EAJI, likewise sold abroad, apparently as G-AUDN in Australia; G-EAJJ, which went to Larkin Supply Co, Melbourne, in March 1920 as G-AUJJ and was scrapped in June 1925; G-EAKH, likewise to Larkin, though as G-AUKH and in existence until June 1928; G-EAKT, apparently crashed before re-registration as G-AUDP (being destined for Tasmania); and - making a total of ten Doves in all G-EBKY already named as the 'Shuttleworth Pup", though equally of interest in having been fitted during 1925 with a horn-balanced rudder; in having once belonged to D. L. Hollis Williams, one of Britain's more eminent aircraft designers and then to C. H. Lowe-Wylde, a man who might well have achieved a similar eminence in the light-aircraft movement had he not been killed in 1933, having founded the British Aircraft Company in 1930. Yet - such were the early post-Armistice years, and the destinies that ruled them - that the ten dainty Doves fluttered vainly out from the Sopwith 'ark', which the famous "zoo" had now become. Span 24 ft 9 J in (7.5 m); length 19 ft 6 in (5.8 m). Weights see footnote. Maximum speed 100 mph (160 km/h); climb to 5.000 ft (1,525 m) 7.5 min; range 250 miles (400 km). N.B. In 1919 the maximum weight was quoted as 1,430 lb (650 kg), the 'normal load' then being given as 365 lb (166 kg) and the 'maximum safe load' as 665 lb (302 kg). The maximum weight later certificated, however, was not 1,430 lb (650 kg) but 1,350 lb (612 kg). THE Sopwith Aviation and Engineering Co. is by no means disposed to rest upon its laurels, and testimony to this effect is furnished by the origination of the three new peace types: the "Dove," the "Gnu" and the "Transport." Further, the company's design and experimental department is being maintained at its full strength and is as busy as ever. Some interesting developments are likely to be heard of in the near future. With the single exception of lighter-than-air craft their experience as that of pioneer designer-constructors covers all types of aircraft, flying boats, sea planes and "land" machines. Furthermore they have built, and had standardised, everything from bombers and torpedo-carriers to high-speed scouts, and in every type they have attained eminence. No better proof of this could be asked than the way in which their type names have become household words. 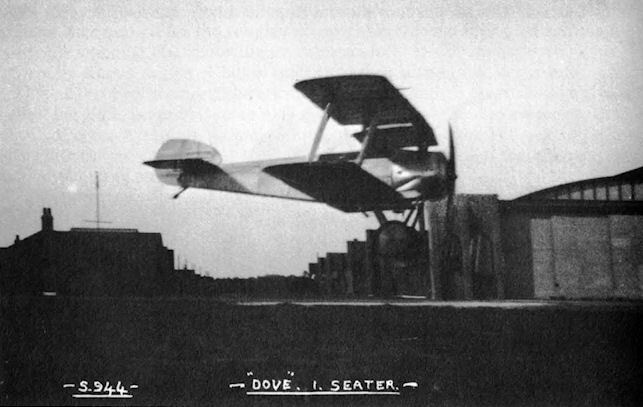 The "Dove" is a sporting two-seater machine fitted with a Le Rhone 80 h.p. somewhat on the lines of the famous "Camel," etc., fighters. Its chief characteristics are as follows :- Span, 25 ft.; chord, 5 ft. 1 1/2 ins. ; gap, 4 ft. 6 ins. ; stagger, 1 ft. 4 ins. ; dihedral, 3°; overall length, 19 ft. 6 ins. ; height, 9 ft. 6 ins. ; area of main planes, 213 sq. f t.; weight fully loaded, 1,430 lbs. ; maximum safe load, 665 lbs. ; loading per sq. ft., 6.7 lbs. ; speed range, 60-100 m.p.h. ; climb, 5,000 ft. in 7 1/2 mins. ; range, 200-250 miles.